P5 did some lovely pop art. This is what we did: We took Photos of our self and the we traced them. Then we put them on to real paper. It was really fun!!! 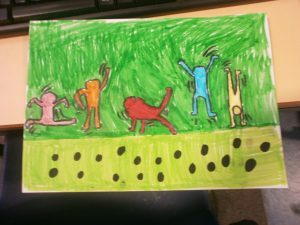 P5 have been learning about Keith Haring. We are going to be doing a massive Keith Haring drawing together in class. Here is a cop of a Keith Haring picture by Evie. P5’s last teacher went to New Zealand. She came to visit us at school. We all gave her a big hug and we showed her some of our work. She went round talking to us about what we have been doing so far. We had made her some cards and some drawings. Today the Sustainability Group and two classes from school went to find out all about recycling in East Lothian at the Kinwegar Recycling Centre near Wallyford. P2/3 and P3/4 were visiting in connection with their topics on Global Awareness, and the Sustainability Group were there to find out how we can make sure our school – and wider community – recycle as much as possible. Mrs Mair ferried groups backwards and forwards to the centre as only 17 people could go at a time for safety reasons. Damien and Mo (Ella’s mum and dad)were there all morning to help us. We all found the trip very interesting and loved watching some of the machines crushing the rubbish! Now we will be watching to make sure we all (at home and at school) make sure we recycle as much as possible. Look out for the recycling police!! Primary 5 visited the nursery this afternoon to read with them. They were asking them about the story and quizzing them on their colours and counting things in the pictures.